I rarely do outfit posts, but since I’m linking up with My Life Well Loved’s #14DaysofStyle contest on Instagram, I thought I’d share today’s look. 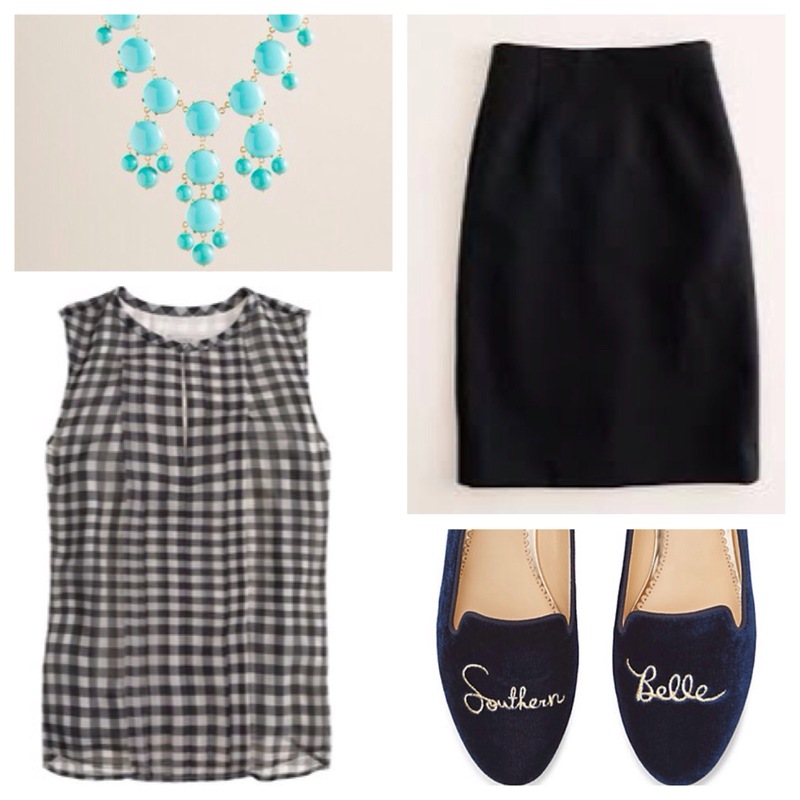 I’m wearing J. Crew’s navy and cream silk gingham top, a black pencil skirt and bubble necklace, and C. Wonder’s blue velvet “Southern Belle” smoking slippers. Clothing: Because we love anything monogrammed, we chose the Intarsia Initial Crewneck sweater, available in six colors ($78). It’s perfect solo or with an oxford shirt layered underneath. Jewelry: By now you also know we love blingtastic arm candy. So choosing this Pave Dome Studded cuff ($98) was a no-brainer. Bags: Who couldn’t use a roomy but fashionable carry-all? This lightweight Nylon Easy Tote ($78) comes in six colors, has inside pockets and can be used as a diaper bag. Shoes: Although we love our heels, and C. Wonder has some options in leopard and accented with glitter, treat your feet to a pair of Pebbled Leather Driving Mocs ($98), great with slacks, shorts and skirts. Accessories: Baby, it’s cold outside! Keep those hands toasty with this pair of Tres Chic Cashmere Intarsia gloves ($58). And yes, you can still use your smartphone while wearing them! Home & Decor: Gold accessories are a huge trend, so why not dress up your serving ware with it as well? These gold ikat Mini Appetizer Plates ($48), Dessert Plates ($48), and Coasters ($38) are perfect for serving your own guests, and would make snazzy hostess gifts as well. We’ll take this matching Tea for One set ($38), too! Ready to shop? Sign up for email notifications and receive 20% off your purchase! The website is also currently offering free ground shipping on orders over $75 and shoppers can enjoy 30% off 3 or more items with code GIFTS30 (terms apply; inquire before attempting to use codes and discounts in-store). C. Wonder is located at 214 Summit Boulevard, near the former Swoozy’s location. True story: when I was about seven, I wanted to be Tootie on the Facts of Life. Remember when she was President of Jermaine Jackson’s fan club?! Okay, so I’m not seven anymore (and there are so many things going on in that first video, starting with what Jermaine Jackson actually used to look like and his bedazzled outfit! And Tootie’s Members Only jacket! And that road manager’s tight jeans and hairline!). But wouldn’t it be amazing to go through life on roller skates the way she used to? 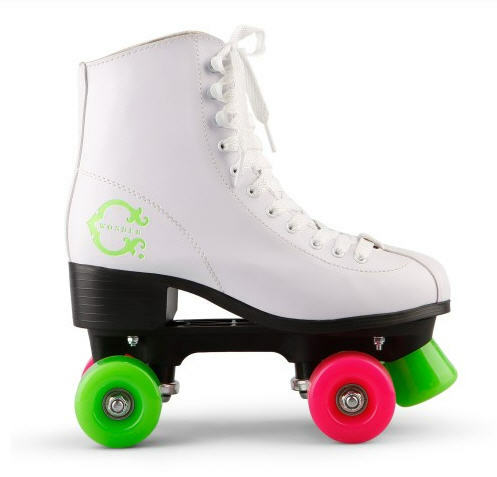 Okay, for the two of you who haven’t now decided I’m a raving lunatic, I saw these old school skates with fun multi-colored wheels at C. Wonder. At $75, all they need is a pair of pompoms and bells laced through them! If I could get away with it, I’d roller skate around downtown in them. It’d make the workday a little more interesting, no? Or maybe I’d just save them for a roller disco night out. In any case, everyone’s closet needs that one whimsical item that makes you smile on the worst days. These skates remind me to keep it moving, no matter what. March came in like a lion with its rainy weather, but the lovely spring days we’re experiencing this week are making me long for something other than filmy sundresses and cute sandals. While some of you enjoy Spring Break, others are toiling away on their keyboards (ahem!). Since I’m not scooting around on a Vespa for a Roman holiday (sigh! ), I came up with a chic alternative. I saw this bike on CWonder.com and suddenly imagined myself gliding down the sidewalk on Second Avenue North to run into Charm or in downtown Homewood to pop into Molly Green, all while lowering my carbon footprint. 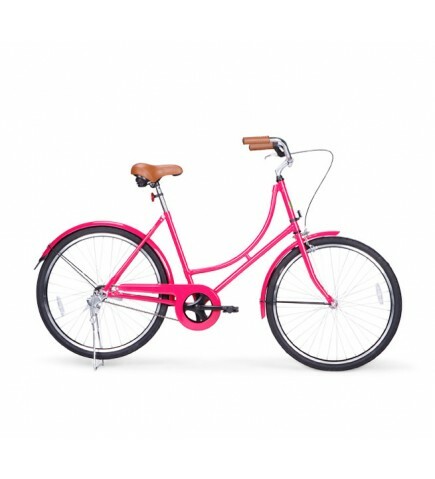 Although I haven’t actually been on a bike since I was 12 and my allergies usually have me hotfooting it indoors, this fuchsia beauty (a unisex model which also comes in navy and orange) is enough to make me break out the Keds and hit the pavement. Even better, the online emporium also offers a chic matching helmet, wicker basket, bell, and bike lock! 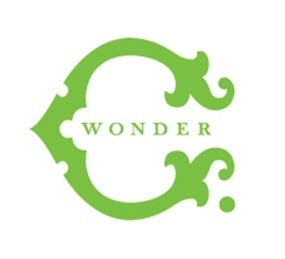 C. Wonder, which was founded by Tory Burch’s former husband Christopher Burch, is built on the premise that every woman deserves a dose of “wonder.” Its flagship store opened in New York this past October (offering shoppers onsite monogramming and dressing rooms in which the music and lighting can be adjusted), and I am loving everything it offers: clothing, shoes, jewelry and home decor.